One of the most iconic works by the American photographer Margaret Bourke-White, Fort Peck Dam, Montana was published on the cover of the inaugural issue of Life magazine on November 23, 1936. Assigned by Henry Luce to cover the massive New Deal project, Bourke-White photographed the dam, the spillway, and daily life in the surrounding boomtown. 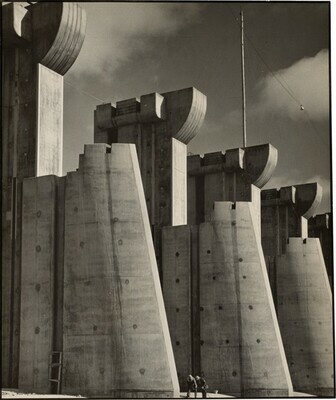 A striking representation of the machine age, this photograph depicts the construction of stark, massive flood gates as well as piers for an elevated highway on the spillway, some three miles from the dam. Monumental in stature, these structures tower over two workers located along the bottom center of the print. The two men not only provide the necessary indication of scale, but also quietly reveal the vulnerable position of the worker in the modern industrial landscape. Made in the prime of her career, Fort Peck Dam, Montana is a vivid, warm-toned, exhibition-sized photograph. The first by Bourke-White to enter the collection, it is a key work in the development of documentary photography during the 1930s and augments the Gallery’s rich holdings of photographs by Walker Evans and Berenice Abbott. Trained at the Clarence H. White School of Photography in 1922, Bourke-White quickly became a successful commercial photographer and a pioneer of photojournalism, working for both Fortune and Life magazines. During her career, Bourke-White recorded the power and beauty of American industry as well as the social hardship and labor challenges facing individual Americans. Weaving the pageantry of capitalism with dramatic personal narratives, she established a mode of documentary photography infused with emotional appeal. Even her own persona was crafted in this manner as newspapers remarked on her daring feats to capture the most enthralling image, from climbing onto the steel frame of the Chrysler Building to standing on a steel mill floor amidst flying sparks of molten metal. Besides important commissions for corporate patrons in the United States, Bourke-White made several trips to the Soviet Union in the early 1930s to photograph the country’s new manufacturing towns. She also authored around a dozen books, including the problematic You Have Seen Their Faces (1937), a documentary photography book examining the impoverished lives of sharecroppers in the South where Bourke-White and co-author Erskine Caldwell contrived a dialogue to accompany the photographs, rather than relying on the words of the subjects themselves. Bourke-White would later become a war correspondent. The first woman to fly a combat mission during World War II, she also photographed German bombs falling on Moscow and the Nazi concentration camp at Buchenwald. Charles Mogull, New York; to his granddaughter; (sale, Bonham's, New York, 29 April 2014, no. 14, as Fort Peck Dam, Montana); NGA purchase (through Howard Greenberg Gallery, New York), 2014.